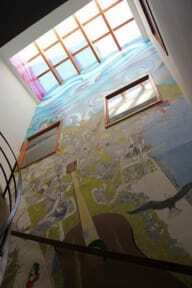 The whole building was painted by various local artists who wanted to be part of the project. After several months of work, the building is now open and ready to share with people from all over the world. 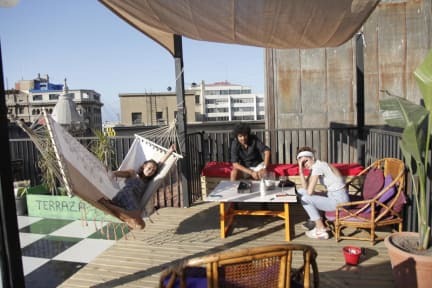 The Hostal Po is a new art space that looks cool, mixes music, art and good services at your disposal to make your stay in Valparaiso a joyful, peaceful, loving experience and find good friends. The site was designed in such a way to show guests a part of Valparaiso in their common areas and also in parts in the rooms. Located in the heart of Valparaiso, just minutes away from Plaza Anibal Pinto, with supermarkets, restaurants, liquor stores, bars and general trading within the reach of all. I really can recommend to everyone to go to Po Hostal. It is one of the best hostels i've ever been. It's so familiar, it's perfect to get in contact with other travellers, the staff is pretty cool, the rooftop is amazing and the hostal is well located. This hostel has the perfect size, it's easy to meet new people. Nice common area and beautiful rooftop terrace. Beds very comfortable. Staff always willing to help. Nice breakfast. Very clean. Amazing atmosphere. Felt very safe and the location couldn't have been better - Really didn't want to leave. sehr bequeme decken, grosses zweierzimmer, haben uns sehr wohl gefühlt. coole dachterrasse. frühstück mit früchten. Great staff!!! Amazingly helpful, special thanks to Marcos who is really funny and helped me so much with finding a place to get out my stitches! Hostal Po felt like home after little time (we stayed 5 nights in total)! There are great spaces to hang out and socialize (the rooftop terrace and great breakfast/living room). Breakfast was great with eggs and lots of fresh fruit and the lockers to stuff your luggage were huge. The only little downside was that it could get quite cold in the evenings in the common area and rooms, but that was also due to our time of travelling. I stayed in Valpariso for 3 nights and had a brilliant time because of the nice other guests. The hostel ja perfectly located close to the Harbour and all main points. Metro and bus stations are close by. Breakfast even includes eggs, (instant) Coffee during the day is free. I really enjoyed my stay here. Im Hostel wurden viele Partys organisiert, an denen auch nicht Gäste teilnahmen. Abends war das Hostel voll mit fremden Leuten. Es gab Affairen, zwischen Mitarbeiter (Volunteers) und Gästen. Diese wurden in den Dorms ausgelebt ohne Rücksicht auf andere Gäste! Für uns ein grosses NoGo! Keine Kartenzahlung möglich. Eine Zimmernachbarin war ganz Verstochen und hat Nachts 2 Bettwanzen gesehen. Es wurd nicht ernstgenommen und gesagt, das waren bestimmt Moskitos.